Every week, New York Magazine writer-at-large Frank Rich talks with contributor Eric Benson about the biggest stories in politics and culture. This week: What the twin scandals of Bob McDonnell and Chris Christie mean for the GOP, and a look at the Oscar nominees. Former Virginia Governor Bob McDonnell and his wife, Maureen, were indicted yesterday for accepting and attempting to conceal $140,000 in loans and gifts (among them private-jet trips and wedding catering) in exchange for helping a shady Richmond-based businessman curry political favor and push a non-FDA-approved “dietary supplement.” McDonnell’s scandal helped Democrats sweep Virginia’s 2013 elections. What is the political fallout of the former First Couple’s indictment and will it lead to more? It was just a little over four years ago that the simultaneous election of McDonnell and Chris Christie to the governorship in two states along the northeastern corridor — the purple Virginia and blue New Jersey — heralded the arrival of a pair of dream presidential contenders for the GOP: relatively moderate, bipartisan-minded exemplars of good governance rather than ideological warfare. In McDonnell’s case, the moderation was a bit of a stretch: He’s the governor schooled at Pat Robertson’s Christian Broadcasting Network University (since rebranded as Regent), whose tenure became synonymous with “transvaginal ultrasound wands” after he endorsed the idea of inflicting them on women seeking abortions. He’s also the governor who left any mention of slavery out of his declaration of Confederate History Month because he wanted to focus only on issues that he “thought were most significant for Virginia.” Now he will also be known for his close association with Rolex, Ferrari, Oscar de la Renta, Armani, Louis Vuitton, Bergdorf, and all the other aspirational brands that he and his wife were able to harvest with the aid of a sugar daddy seeking a gubernatorial blessing for a pseudo-pharmaceutical product that sounds suspiciously like snake oil. McDonnell has a better chance of landing in prison than the White House. His household scandals paved the way for a most unlikely figure, the freewheeling Clinton crony Terry McAuliffe, to succeed him as Virginia’s governor. That’s the local political fallout. 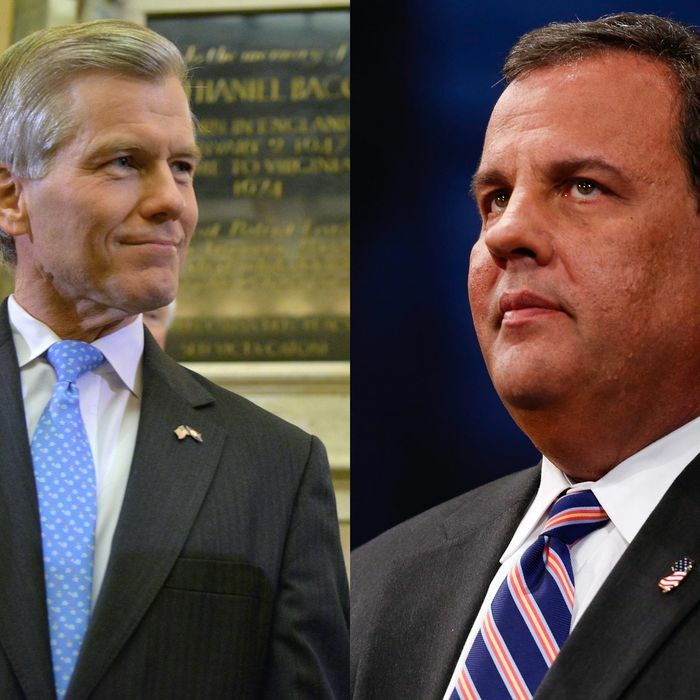 As for the future national fallout: The one-two punch out of McDonnell and Christie has pretty much leveled the media and GOP Establishment fantasy that the Republicans might nominate a “centrist” conservative for president in 2016. As I’ve said before — and before Christie’s fall — the front-runner for that nomination, at this early date at least, is Rand Paul. Unless, of course, Mitt Romney is inspired to run again by the runaway success of the humanizing documentary Mitt at Sundance. It goes up on Netflix on Friday, and may prove a winning political antidote to the repellent fictional Democratic politician Frank Underwood, soon to return in season two of House of Cards. Christie was inaugurated yesterday amid scandals over the George Washington Bridge lane closures, Sandy relief money, and a growing sense that his office routinely punished his political adversaries. You dismissed Christie’s presidential chances before these scandals. What happens to him now? Can he still be a viable governor? And are there any conclusions we can draw between McDonnell’s abuses of power and Christie’s office’s misdeeds? Before the scandal, Christie had about as much a chance of winning his party’s hearts and minds on the primary circuit as his fellow bully Rudy Giuliani did in 2008. In their own party, they are considered quasi-leftists by the grassroots. Now fellow Republicans have another reason to beat up on Christie, and so they are, with even (relative) moderates like Lindsey Graham joining long-time Christie bashers like Rand Paul in piling on. When Christie went down to Florida over the weekend to fund-raise for the reelection campaign of the incumbent Republican governor, Rick Scott, the two men had no joint public appearances or press conferences. Ken Cuccinelli, the right-wing former Virginia attorney general who lost the Virginia governorship to McAuliffe in part because of the McDonnell scandal, has just become the first to call for Christie to resign as chairman of the Republican Governors Association. Christie cannot be a viable governor if he is spending all his time trying to defend himself. And he will keep having to defend himself until we get the answer, for starters, to the basic question that every voter is still asking: How does an underling send the order “Time for some traffic problems at Fort Lee” and get it executed on the busiest bridge in the world for four disruptive days without someone above her knowing about it or acting to end it? We also don’t know what other scandals will emerge, including the dirt that turned up in the Romney campaign’s vetting of him for the vice-presidency, or to what extent Christie and his circle will stonewall investigators and subpoenas. It tells you a lot about what’s to come that Christie has now hired a Giuliani crony, the criminal lawyer Randy Mastro, to help him circle the wagons as investigators flood into Trenton. Meanwhile, Christie’s public persona shows no signs of real contrition. He remains a world-class narcissist who regards himself, not his constituents, as the truly “sad” and “heartbroken” victim of the scandal. By the count of James Warren of the Daily News, Christie still managed to use the pronoun “I” nearly twenty times in his downsized eighteen-minute inaugural address yesterday. This is going to be a long second term. If there’s a unifying lesson to be learned from the double-header of the McDonnell-Christie scandals, it’s only that dubious character is hardly a bar to running for governor. Yesterday, the Republican senator David Vitter, best known for turning up in the phone book of the “D.C. Madam” in 2007, announced he would seek Louisiana’s state house in 2015. Somewhere, perhaps, Rod Blagojevich is laughing. Last week, the Oscar nominations were announced, with American Hustle, Gravity, and 12 Year a Slave getting the most nods. Did the Academy do last year’s films justice? And what or who were you most sorry didn’t make the cut? This was such a great year for movies that there was no way even the Oscars could screw it up. I am a fan of Inside Llewyn Davis — a taste not universally shared — so I was sorry to see it snubbed. I remain baffled by the popularity of Gravity, a bravura slab of cinema smothered by a syrupy script that is as mawkish as it is unbelievable. (But if grosses count at the Oscars — and they do — it must be considered the front-runner.) I look forward to watching the ceremony, and hope that Mitt Romney, who spurned a Tony Awards invitation to present a trophy to The Book of Mormon a few years back, will serve as a presenter this time, now that he’s got skin in the Hollywood game.